Breast Augmentation is the most commonly performed cosmetic surgery procedure in the world for figure enhancement in a woman. Implant technology has improved greatly over the last decade and Dr. Rossi prides himself on being up to date with the latest trends and safety measures. Dr. Rossi is known for his catered approach to each individual breast patient and truly listens to each unique patient’s desired outcome. His artistic eye and high level expertise helps guide discussions with patients in deciding on the appropriate implant size, shape, profile and type of surgery required to achieve their desired result. Dr. Rossi’s patients often comment on how natural and perky their breasts look and feel post-operatively. Mommy Makeover with 345 cc Shaped silicone implants and Drain Free Tummy Tuck with Dr. Rossi’s Designer Belly Button. *After surgery, you will likely be advised to wear a compression garment to aid with swelling and to keep you comfortable. Swelling will typically subside after about three weeks but may last as long as a few months. For the first few days after surgery you will need to get plenty of rest and avoid bending or lifting. Most patients are able to return to work in one week and resume regular exercise after about six weeks. Your surgeon will give you more detailed information about what you can expect during your recovery. A. 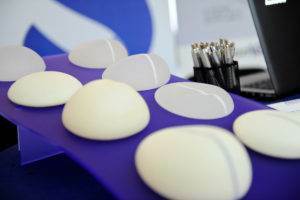 *Breast implants are not considered lifetime devices and may need to be replaced at some point after the original surgery. However, most surgeons agree that replacement is not necessary unless an issue arises. On average, most women have their implants replaced between ten and fifteen years after they are first inserted. A. *Incisions are placed in locations that are as inconspicuous as possible, and the resulting scars will fade significantly over time. Protecting your scars from the sun will help prevent them from darkening.